The Mira is a modern bed with soft curved lines which will fit into any bedroom. It is finished in g.. 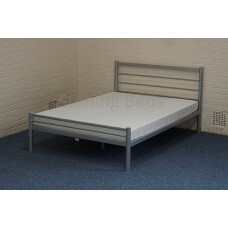 The Perris Bed Frame has a sleek contemporary design and is finished in silver with light oak colour.. The Lauren metal frame features a traditional head and foot end and is available in a Gloss White fi.. The Millie bed frame has a classic design and features large diameter corner posts, decorative feet ..